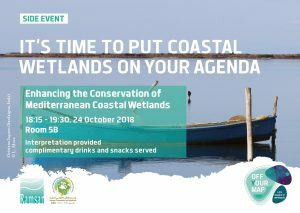 The Ramsar Convention on Wetlands organizes its Conference of the Contracting Parties (COP) every three years, bringing together representatives of the member governments to the Convention (presently 170), a large number of international and non-governmental organizations (NGOs), as well as experts on wetland-related issues. The thirteenth session of the Conference of the Parties (COP13) will be held in Dubai (United Arab Emirates) from 20 to 29 October 2018, with a focus on the theme “Wetlands for a Sustainable Urban Future”, which highlights the important role played by wetlands in making cities livable. The Ramsar Secretariat has published a new report named ”Global Wetland Outlook: State of the world’s wetlands and their services to people 2018”. The report provides a current overview of global wetlands: their extent, trends, drivers of change and the responses needed to reverse the historical decline in wetland area and quality. A space dedicated to the Mediterranean community of Contracting Parties, partners and observers at the 13th Meeting of the Conference of the Parties to the Ramsar Convention on Wetlands (COP13, Dubai, UAE). The presentation of organisations’ projects and the discussion of their activities related to Mediterranean wetland conservation. The screening of videos related to Mediterranean wetlands. Sharing ideas and exchanging experiences through formal and informal discussions. The organization of exhibitions and the display of scientific posters. The presence of an “Off your map’’ campaign on coastal wetlands through activities and communication items such as games and roll-ups on coastal wetlands, stickers and badges, postcards on coastal wetlands’ benefits, and bracelets. Official “side events” are parallel mini-events organized during the “free times” (lunch time and others around plenary sessions) that allow participants to present project results or any other implementations of the Ramsar Strategic Plan in the Mediterranean region. 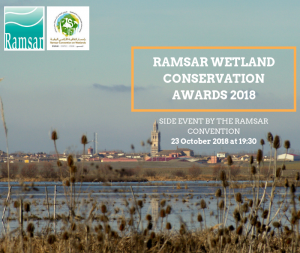 The Ramsar Wetland Conservation Awards 2018 recognise and honour the achievements of individuals, organisations and governments around the world for their efforts in the conservation and wise use of wetlands. The Award for Wetland Wise Use will be presented to Fundación Global Nature for its efforts to restore La Nava Lagoon, a 2,200 hectare steppe lagoon that was drained in 1968. Organisers: The Government of Tunisia. Partner institution(s) / organization(s): the Government of Slovenia, the Government of Senegal, the Government of Burkina Faso, IUCN World Heritage Programme, Emirates Wildlife Society, ICOMOS, MedWet, MedINA, Wetlands International, Youth Engagement Thematic Group, WWF, Arab Regional Centre for World Heritage, UNESCO World Heritage Centre, WWT, Wetland Link International, and World Wetland Network. The event will celebrate the powerful role that cultural values and communities can play in improving conservation outcomes for wetlands. It aims to highlight the achievements of the MAVA-funded project “Conservation of the natural and cultural heritage in wetlands: Global leadership for an integrated approach through the Ramsar Convention” (March 2015-March 2018). Organisers: the Albanian Ministry of Tourism and Environment, the Spanish Ministry of Ecological Transition, the MAVA Foundation, WWF Greece, and MedWet. Find out more about the Coastal Wetlands Conservation Program in the Mediterranean and the new Off Your Map campaign*, supported and funded by the MAVA Foundation. The program supports conservation, management, integrated governance and socio-economic outcomes for four demonstration sites in the Buna River Protected Landscape (Albania), Oristano (The MARISTANIS project, Sardinia, Italy), Ulcinj Salina (Montenegro), and Ghar el Melh (Tunisia). Together with the island wetlands inventories, the The MedIsWet project is implementing the Ramsar Resolution XII.14 on Conservation of Mediterranean basin islands wetlands. Organizers: the French Ministry of the Ecological and Solidarity Transition and the Mediterranean Wetlands Observatory, with Tour du Valat and MedWet. 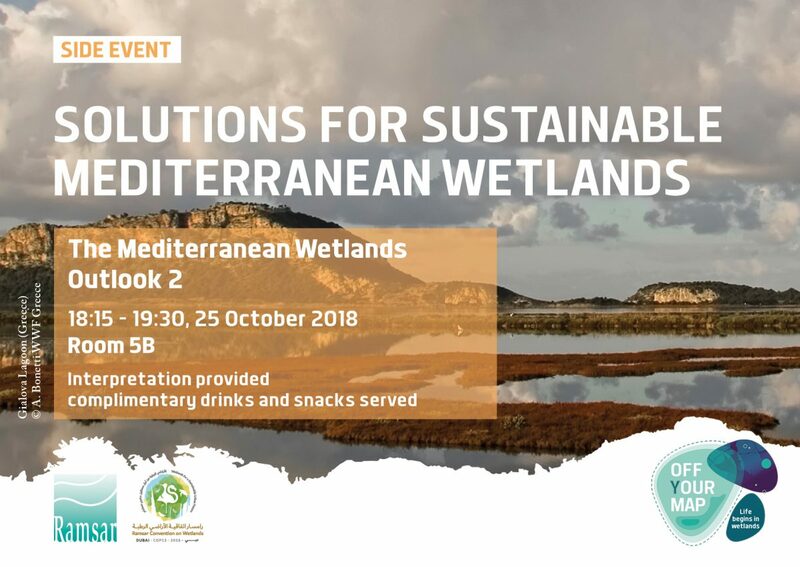 This report is produced by the Mediterranean Wetlands Observatory under the umbrella of Tour du Valat and the Mediterranean Wetlands Initiative (MedWet). The report, including its 16 indicator factsheets, provides regional support for the findings of the Ramsar Convention’s first Global Wetland Outlook (GWO): the State of the World’s Wetlands report, issued at the Convention’s COP13. The Ramsar Convention awards go to 18 cities that have taken exceptional steps to safeguard their urban wetlands, and the city of Ghar el Melh is one of the candidates that will receive such an award in 2018. The city hosts the Ghar el Melh lagoon, a Wetland of International Importance and one of the pilot sites selected for the coastal wetlands strategy supported by the MAVA Foundation, coordinated by the WWF North African Office, supported by Off Your Map campaign. The side event aims at further developing the findings and recommendations of the Ramsar Technical Report with presentations of best practice examples from the various projects that contributed to the Scientific and Technical Review Panel (STRP). The presence of the Mediterranean at the Ramsar COP13 is supported by the MAVA Foundation, the French Ministry of Ecological and Solidary Transition, the Prince Albert II of Monaco Foundation and the Total Foundation.